That influence remains something of a paradox: a small, underfunded, specialised provincial organisation with an abiding commitment to its local and educational briefs, the Darkroom nevertheless enjoys an international reputation unusual for a British gallery, let alone one outside the capital. Much of the credit for that must go to Mark Lumley, the gallery's first director, and to the administrative team he put together during his time in Cambridge. Mark retired last August after six-and-a-half years on the job, so this seems as good a time as any to look back at the Darkroom's achievements during its first half-decade and consider what made it special. I first met Mark during the course of the 1983 Cambridge International Poetry Festival, a valuable and now sadly defunct institution which that year had managed to attract an even more eccentric and memorable group of people than usual, among them David Gascoyne, Miroslav Holub, Peter Levi, Czeslaw Milosz, Rex Warner and William Empson, to say nothing of an unruly Greek contingent for which I was largely responsible. Much of the space allocated to festival headquarters in the Cambridge Union Society, seemed, when I first arrived, to be taken up by a makeshift portrait photographer's studio, including a full-length white seamless backdrop and a battery of electronic flash units; this, it transpired, was in the interests of Mark's ambition to make a photographic record of everybody connected with the festival. An apparently endless series of minor crises requiring my presence at headquarters on a semi-permanent basis, I had ample opportunity to watch Mark at work; he would grab poets as they walked into the office, coping with the shy, the belligerent, the inebriated and the vain with equal, quiet efficiency. During fallow periods, we discussed photography in general and its remarkably low to non-existent profile in East Anglia in particular – whereupon I discovered that Mark was already deeply involved in plans for a new photographic gallery. 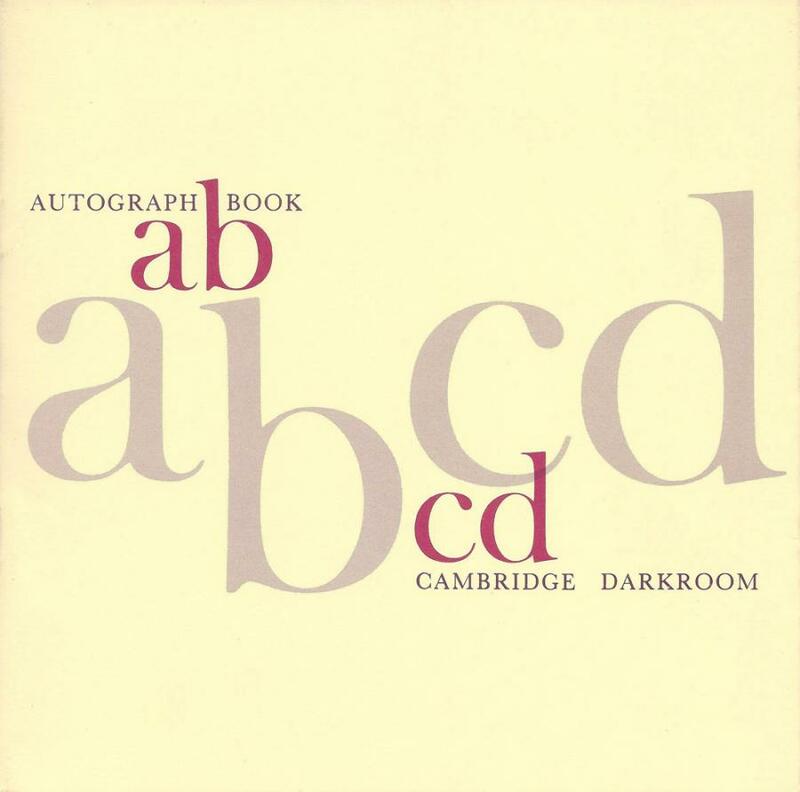 A few months later, I received an invitation to contribute a self-portrait to Autographs, the Cambridge Darkroom's inaugural exhibition. In 1982, Mark had joined up with Roy Hammans and Brian Human, two Cambridge photographers responsible for starting the St.Matthews Photography Group in the Bath House Neighbourhood Centre; under the influence of their joint enthusiasm, the initial organisation mushroomed, involving elementary photography courses, school projects, talks and exhibitions in the public library; the group was helped by a modest level of local funding, but further expansion had been frustrated by lack of space. Next year, when the Dales Brewery in Gwydir Street suddenly became vacant and was taken over for redevelopment by Cambridge Council, a proposal was quickly submitted for a permanent photography centre and gallery space. Thanks to Human's knowledge of local politics and grants from Housing the Arts and the Gulbenkian Foundation, the proposal was accepted in record time, and Mark found himself appointed full-time coordinator. It took almost exactly a year from the initial prospectus to the launching of the Darkroom in January 1984 with a staff of six, three full-time and three part-time. In the meantime, the original team had been joined by Pavel Büchler, who produced the gallery logo and has since been responsible for the design of every Darkroom publication, catalogue and poster. Apart from his design function, however, Pavel had very definite ideas about the direction the new gallery should take – ideas which dovetailed neatly with Mark's, so that he became co-director with particular responsibility for exhibitions until mid-1986, remaining closely linked with the gallery thereafter as occasional curator and designer. Perhaps precisely because of radical differences in their character, style and background, the Lumley-Büchler team proved an unusually potent combination. It is difficult, and probably pointless, to try and disentangle the precise degree of input which both contributed during the course of their two-and-a-half years together; describing the general division of labour, Mark has defined his role as that of a facilitator who was largely in charge of internal negotiations, administration and the politics of funding, while Pavel maintained a more visible profile as the Darkroom's interface with the art community. Borrowing from cinema, Mark has also used the terms ‘producer’ and ‘director’ to describe their respective activities. Both started from a deep sense of frustration with the British tradition of photographic representation and its exhibition. Though it took a while for a position to develop, they began with a good sense of what interested them; Roger Palmer's practice was identified early on, resulting in an important one-man show during the gallery's third month of operation. A concern for the more conceptual uses of photography was evident from the start, and although it never became an exclusive orientation, it has remained one of the Darkroom's most characteristic strands. Both Mark and Pavel have also been concerned to develop photography's links with the other visual arts; for them, consideration of the medium in isolation appeared pointless. Their intentions were made clear by the gallery's initial three-month program, which included not only exhibitions, but also a programme of experimental film by Penelope Webb and performances by Christopher Tabecki. In Mark's perceptive words, the Darkroom was to represent “a practice rather than a medium”. To continue quoting Mark, “The notion of a photographic gallery can be misleading. People come in expecting an easily understandable message, and can be confused to find it expressed in an art context. While many photographic galleries often feel themselves obliged to follow what they see as a populist brief, this results in even greater confusion rather than a clarification of stance. I think it is important to take a specific stance. There is a certain amount of misunderstanding within the so-called independent sector about the function of galleries – which is, after all, to show the arts. Other areas, which are perhaps more issue based, are still important, but the principle function of a gallery is to disseminate a practice“. Opening in January 1984, Autographs presented, according to the elegant catalogue, “the attempts of 43 British photographers to portray themselves and to give a specimen of their professional ‘handwriting’ in a single picture or a small set of images”. The 43 were a surprisingly varied bunch, including Keith Arnatt, Bill Brandt, Victor Burgin, John Davies, Paul Hill, Sharon Kivland, Angus McBean, Sue Packer and Chris Steele-Perkins; the results were as mixed as might be expected, ranging from the humorous (a blurred, accidental exposure of a goldfish-like Arnatt) to the flamboyant (Brian Griffin dramatically illuminated by what looks like a block of radioactive margarine) and the frankly unpleasant (Sam Haskins absent-mindedly fondling a model's backside in a phone booth), but it all made for a good send-off. The rest of the first year's program largely set the tone for future developments. Though the Darkroom has maintained a very high proportion of self-originating exhibitions (about 75% of the total), it has always been ready to accommodate important touring shows, including some which must have seemed far too large for the relatively small space available; amazingly, 1984 showed that the Hayward's Hockney and Koudelka exhibitions could both be squeezed in thanks to an ingenuous system of movable panels. Other touring exhibitions taken on have included Mario Giacomelli (1985), David Goldblatt (1986), Georges Rousse and Patrick Tosani (both 1988). If group shows were a good way of gradually defining the gallery's objectives, they also rapidly became the source of its greatest influence; long before any other institution thought of doing so, the Darkroom sought – in medias res, as it were – to define and pin down the changes occurring in British photography.The most influential was undoubtedly Re-visions (summer 1985); subtitled “Fringe Interference in British Photography in the 1980's”, it included new work by Helen Chadwick, Sharon Kivland, Karen Knorr, Mark Lewis, Yve Lomax, Mari Mahr, Olivier Richon and Susan Trangmar, and was accompanied by a substantial catalogue which is still one of the few useful items in the decade's all too exiguous bibliography. Other important group shows included Multiple Visions (May 1986) which showed the use of found imagery by Ron Haselden, Colin McArthur, John Stezaker and Paul Wombel; Boundaries (summer 1986), an exhibition of landscape work by Thomas Joshua Cooper, Hamish Fulton, Andrew Ginn, Goto/Eachus, Jim Harold, Roger Palmer and Chris Wainwright; and Figures (May 1987) which concentrated on representations of the human body by Sue Arrowsmith, Helen Chadwick, Sorel Cohen, Harald Falkenhagen, Joe Gantz, Roberta Graham, Jan Krizik, Jean-Marie Prouveur and David Ward. True to the Darkroom's established commitment to artistic pluralism, Figures also included performance pieces by Mona Hatoum, Andre Stitt and Nick Stewart. Another source of influence were the bi-annual open submission shows, which unlike many of the species usually managed to be adventurous in their selection while remaining reasonably well integrated. The first of these was Sequences (1984), which focused on sequential imagery in photography and related media; one of the selectors was Hilary Gresty, the curator of Kettle's Yard Gallery. Hilary had made contact with the Darkroom early on, expressing a desire for collaboration between the two galleries which was to become more concrete two years on with next: tomorrow, the second open show. A joint exhibition with a hopelessly vague brief (“a vision of what is to come next”), it turned instead into an uneven but stimulating survey of recent camera-based fine art practice by 33 artists and photographers – in effect, an update of Re-visions. The high points included John Goto's Albuferian Sketches (paint on photographs), Helen Chadwick's One Flesh (photocopies, later purchased by the V&A), Mona Hatoum's Changing Parts (video) and Noel Taylor's Scorched Earth (video installation). The 1988 open exhibition, Death, was by far the most ambitious, including no fewer than 68 artists in both venues. The organisers had by now taken the logical decision to abolish all media distinctions, allowing in painting, sculpture, installation and performance. Perhaps because of the subject, the results this time were more mixed, with rather a high mawkinshness index – Cot Death, a set of 11 prints by Bruce Goodison, seemed to combine sentimentality and opportunism in a particularly unpalatable way. The two high points of the show both involved sculpture: Jane Mulfinger's Re-Collection projected funerary images from various sources over a life-size reconstruction in plaster of a found photograph of an elderly couple, and Darrell Viner's But Not Forgotten, an unquiet grave covered in buttons which rippled and shifted under the impetus of a hidden electric motor. Paddy Summerfield, an unfairly typecast photographer of whose recent work only the Darkroom appears to be aware, once again contributed some strong, understated prints. Neither has the Darkroom been unaware of recent developments in other countries, hosting three large survey exhibitions in as many years: Remnants of the Authentic (1987) covered German photographic art of the eighties and included among others Walter Dahn, Astrid Klein, Thomas Ruff and Michael Schmidt; the ICA-originated Elsewhere (1988) dealt in photo-based work from Australia; and the recent (July 1989) Shadow of a Dream was a Darkroom-organised exhibition of contemporary French work, including a Boltansky "altar", which is due to travel to the Impressions and Untitled galleries. If group shows have been one of the Darkroom's particular concerns, this should not overshadow the gallery's record of individual exhibitions, some of whose highlights have been the juxtaposition of Hannah Collins' Night Shots and Julia James' Night Sisters (1985), Verdi Yahooda's stairway installation (1985), Richard Ross's Museology Photographs (1987), Andrea Fisher's installation A Fleeting Moment (1987), Pavel Büchler's Untitled Portraits (1989) and Lizzie Calligas' Metamorphoses (1989). Three exhibitions in particular, however, involved a major effort on the Darkroom's part and can be said to represent landmarks in the careers of the artists concerned. Review of Work 1950-85 (March 1985) presented a complete cross-section of Jo Spence's activities from her days as secretary to a photographer's studio down to the latest work on photo therapy; in the artist's own words, "In putting together this Review of my work I finally came to see and understand my own central obsession with photography...". Roger Palmer's Precious Metals (September 1987) was probably the Darkroom's most successful touring show, travelling to five other venues including the Serpentine Gallery; it was accompanied by a particularly well-designed catalogue which coped effectively with the problem of handling Palmer's image-and-text triptychs on the printed page. Finally, the 1988 exhibition of Craigie Horsfield's large, brooding black-and-white prints represented the discovery, through the agency of John Goto, of a major artist who had been working in total obscurity for well over a decade. A comprehensive account of the Darkroom should at least mention the lecture program, with speakers ranging from Ian Jeffrey to Emmanuel Cooper, the workshops, and the many extras such as film and video screenings; these activities, though they might make less of an impression outside Cambridge, have been important in forging links with the local community. As is the case with almost every publicly-funded gallery in Britain, the Darkroom has gone through a number of financial crises, and local support is crucial to its continued existance. Mark's newly appointed successor, Claire Macdonald, will take over in January 1990. In the meantime, the Darkroom is being run by the full time administration and education officers under the watchful eye of its board director, Ivan Gaskell. Closely involved with the gallery's artistic policy for the past year, Gaskell plans to maintain the Darkroom's commitment to photo-based art, while exploring a wider range of relationships between photography and other media such as sculpture, music, video and installation. Another open exhibition with Kettle's Yard is planned for next autumn, and it is hoped that more site-specific work will be commissioned in future. While the future of purely photographic galleries is increasingly coming into question, the Darkroom's influence can be seen in the fact that other institutions have already started to widen their brief in a similar manner. If five years of successfully defending and expanding the practice are anything to go by, the Darkroom will continue to show the way forward. John Stathatos had two one-person exhibitions at the Cambridge Darkroom: Mother of Churches (1984) and Three Heraclitean Elements (1991); he also took part in the group exhibitions Autographs (1984) and Death (1988). An account of Cambridge Darkroom's history by co-founder Roy Hammans may be consulted here.